Since 2013, Warner Bros. has worked hard to put out their own superhero cinematic universe, following in the footsteps of the Marvel Cinematic Universe, while also taking a number of leaps to keep their franchise quite different. While quite a few of these movies were met with notoriously bad reception, there have also been quite a few hits scattered in this controversial franchise. 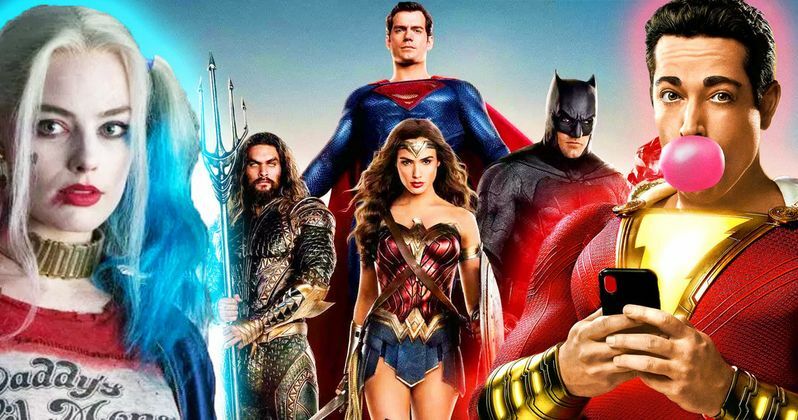 With the most recent addition of Shazam, the DC Extended Universe is starting to look brighter, with many of the most recent releases being distinctly better than the first few. But where does each DCEU movie actually stand against the others? Here is every DC Extended Universe movie ranked from worst to best. It doesn't take much to argue why Suicide Squad is the lowest quality in the franchise. While it certainly had a few redeeming qualities, it definitely did not have enough of them to warrant the choppy narrative, poor acting and radically changing tones. The issues with Suicide Squad can be greatly credited to its studio interference and how rushed everything was. When writer / director David Ayer was brought onto the project, he reportedly was only given 6 weeks to write a finalized script, which is certainly not enough time by any means. After the movie was shot, Warner Bros. ordered for half of the movie to be reshot to match the tone of its campy "Bohemian Rhapsody" trailer, despite the movie initially being shot with dark tones. This resulted in half of the movie feeling dark and gritty, and the other half feeling bright and happy, making it incredibly apparent which scenes were part of the reshoots and which were not. To make matters worse, the studio soon ordered the movie's best scenes, featuring Harley Quinn and Joker, to be cut from the movie entirely, not being seen until its DVD release. While parts of the movie were certainly a bit of fun, overall, this entire production was a trainwreck and quite possibly the studio's most embarrassing movie of recent years. 2016 was evidently a bad year for the DCEU, with Batman v. Superman: Dawn of Justice having almost as many problems as Suicide Squad. This movie also felt very choppy, with the motivations of each character feeling incredibly vague and hard to follow. The main example of this was Superman, who had almost all of his scenes cut from the movie, with him only showing up from the point of view of Batman. This resulted in Superman having very little motivation or development throughout the duration of the movie. The fact that the movie only featured Batman and Superman actually going head to head for a few minutes, despite having an incredibly long run time, made matters worse. The main fault of Batman v. Superman is credited to how much had to be cut. Reportedly, director Zack Snyder's final cut of Batman v. Superman was about four hours long, which is way too long for a theatrical release and much longer than what the studio had ordered him to make. Realistically, cuts had to be made to the project, erasing elements of what we can assume created an in-depth plot, turning the movie into a choppy mess with only fragments of the original vision being left behind. All things considered, Justice League turned a lot better than it could've been. Much like Batman v. Superman, the movie suffered from director Zack Snyder reportedly taking too many liberties with the project, resulting in extensive reshoots and lots of cuts. When Snyder and Warner Bros. parted ways on the project, The Avengers director Joss Whedon was brought on to direct the reshoots. While Whedon definitely did help save elements of the movie, it still suffered in a similar way to Suicide Squad by having drastically different tones that flip-flopped throughout the course of the movie. The redeeming qualities of Justice League came in the form of Superman and the movie's score. The music for the movie was scored by Danny Elfman, who brought back his theme from the 1989 Batman and John Williams's theme from the 1978 Superman. The return of these themes added a powerful element of nostalgia, which at least made the movie enjoyable to people who enjoyed the classic DC flicks. Superman also added to the enjoyability. Though the CGI on his face was atrocious, Joss Whedon helped redefine the character in the DCEU to make him feel more like the bright superhero from the comics rather than just another brooding hero. Though the movie as a whole had a number of issues, there were enough redeeming qualities in Justice League to at least make it an entertaining ride. Man of Steel is perhaps the most successfully philosophical movie in the DCEU, theorizing how the world would respond if humanity was introduced to an actual super man from another planet. This was a theme that Snyder attempted to replicate in his later movies, but Man of Steel is the only movie where it actually works. While Man of Steel did suffer from quite a few issues, including a final fight that lasted way too long while adding little to the overall plot, there was still a great deal of emotion that hooked audiences into Superman's character. The movie practically redefined this iconic superhero and humanized him in a way we have never seen before. While the later movies took Superman's newly introduced brooding to a new, dangerous level, Man of Steel managed to balance it properly, being a well told, in-depth origin story that made us look at Superman in a new light. While Aquaman was quite far from a masterpiece, it was still a wildly entertaining addition to the DCEU that almost everyone who saw it managed to enjoy. The plot was a bit derivative, but still fit the character of Aquaman, managing to redefine this aquatic hero that has pretty much been a joke for decades. The hilarious performance by Jason Momoa certainly added to this. Even when the plot felt cliche or the acting seemed lackluster, Momoa never ceased to entertain the audience with some witty banter or by some funny, non-verbal motions. One of the best aspects of the movie, however, was its color. Many of the previous additions to the DCEU had great cinematography, but the dark, desaturated tones kept the shots from being visually appealing. Aquaman made up for this by not only having some great cinematography, but by making the colors pop on screen, with almost every frame looking like a gorgeous painting. This helped keep audiences' eyes glued to the screen in ways that movies like Batman v. Superman were unable to accomplish. The DCEU's first female-led movie proved to be one of its best. Wonder Woman had an innovative plot, but also had some powerful morals about not underestimating people simply based on their appearances, a theme that applied not only to Wonder Woman herself, but also to her companions as they went on their adventure. Unfortunately, the biggest drawback of Wonder Woman was its third act, which like many DC movies, put the cool effects of a fight over the emotional stakes of the characters. Regardless of the disappointing final fight, Wonder Woman still stands strong as one of the best movies in the DCEU. Its greatest moment is arguably the No Man's Land fight scene, which felt inspiring and full of hope during a place in the movie where all hope seemed to be lost, which may even be representative of the DCEU at the time of Wonder Woman's release. Alas, the most recent addition to the DC Extended Universe is its strongest. Shazam! was able to carry a lot of heart and comedy, while also using what most people know about superhero origin movies and subverting that into a new, entertaining experience unlike anything we have seen in the DCEU before. It carried elements of hope and inspiration like Wonder Woman, philosophical questioning of what it even takes to be a "superhero" like Man of Steel, a lot of fun and a vibrant color palette like Aquaman, and an exciting super-team element like Justice League. Though it was the least connected movie in this franchise, Shazam! still took a lot of elements from previous DCEU movies and pieced them together almost perfectly in a superhero movie that keeps audiences and critics alike optimistic for the future of the franchise as a whole. While everyone obviously has their own opinions on the DCEU, with some viewers preferring movies like Suicide Squad over Aquaman and Wonder Woman, from both an entertainment and quality perspective, this is the order that we feel the movies of the DCEU deserve to be ranked in. While the overall quality of the DC Extended Universe is still leagues away from the quality and success of the Marvel Cinematic Universe, this Warner Bros. franchise is finally doing a darn good job of catching itself up.